Ever since I heard the word "multitasking," I knew that it was an inhuman trait. The term is quite popular though, as if everyone should be able to multitask. It became the new catch word on résumés. 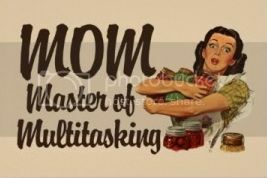 Good mothers are considered to be natural multitaskers or else...what? They are not such good mothers? They even have come up with a cutesy acronym: M.O.M. standing for Master of Multitasking! I am NOT a multitasker! I know myself. I am the type of person who once my attention is pulled off one task, has difficulty shifting back to that task. This is not to say that I am easily distracted, quite the opposite. Once my mind is set to a task, I find distractions irritating and time consuming, not good for a mother who is often distracted by a child's question. However, if I really do not like the task then I may be a bit more welcoming for distractions. I am more of a single-minded person. One who can give a great deal of attention and concentration to a single task to the point that I seem absent-minded. That is not to say that when I am doing a task that does not take much thought that I cannot engage my mind on other things. One of my favorite things to do is fold laundry while talking on the phone to a friend. You see, I dislike folding and putting away clothes. It is a repetitive, mindless, routine task, but when I am talking with a friend on the phone using my headset so my hands are free and my neck is not pained from holding the phone, I do the task without thinking about it in a very short time. In fact, when a friend calls, I look for clothes that need folding or something that needs cleaning or some other repetitive mindless task. Still, this does not qualify me as a multitasker because any two things done together that requires a bit more thought I do not do well. For instance, talking to a friend and cooking at the same time is never a good idea for me. Listening to music and cooking is okay, but trying to sing along and cooking or baking at the same time, not good either. This week was one of those weeks that would have gone a bit better if I was a multitasker. It all started with when I asked my daughter to get chicken wings out to thaw for our dog, as she eats one raw wing for daily breakfast. I did not see until after it was thawed that my daughter had mistakenly grabbed a package of chicken breasts, which makes me wonder how the child who has been reading since she was four years old suddenly cannot now. Then I went to look in the chest freezer and not finding any wings I mistakenly got out rabbit legs thinking they were the shoulders that we usually give the dog because I was in a hurry and a bit angry. Also, not a good combination. So, then I have the meatiest parts of a chicken and a rabbit thawed but still no raw dog food. I would have to grill these meats, which I did on Tuesday night even though we still had plenty of roast left from the Seder meal and turkey breast that we had thawed earlier for sandwiches and dinners with gravy. My husband came home Wednesday night and took us out to eat, which is usually my fasting day, but I made an except for the dinner meal. He was supposed to be home in mid afternoon but got delayed and then ended up in spring break traffic. We finally were at the restaurant just before 7:30pm. Thursday, he warms up the roast which is still very tasty. I mentioned something about the grilled chicken and rabbit, but he says he did not see them in the refrigerator. It then dawns on me how I had put them in the oven to cool while we were eating to keep the cat from getting to them as they were too hot to put into a container just then. Yes, they were still in the oven dried out but not spoiled so they were warmed up in a pan with water and eaten last night...and, no, we did not get sick. You know, people did survive without refrigerators for many centuries. That was not the worse of it though. On Friday, I also had decided to bake pizza crusts and hamburger buns to freeze. I had not been baking much and so I fed and left out my sourdough starter for a over a day to get it activated. It was doing well so I added enough flour and water for the recipe with some left over to keep as my starter. Zipping to the event, I had baked one pizza crust and was putting in the second when I realized that the starter in its usual glass jar was still near the oven vent to warm a bit when I had the dough rising in the warmed oven. But, now the oven was hot as I was baking and I stupidly picked the jar up, immediately getting burned so I dropped it on its side onto the baking pan. That is when I grabbed the pot holder and stood the jar up hoping to still save the starter while thinking the heat probably killed off all the wild yeast and I would have to make another starter, which takes a least two weeks. One side of the jar had baked some but the core temperature of the starter was warm, not hot. Probably a good temperature for the yeast, I hoped, so I poured out the starter into another container and fed it with more flour and water, which cooled it more. I made this starter over four years ago and all I can say is I am so thankful for its resiliency! Yes, it is just fine. I should have blistered from the burn, but I have a number of alternative health items at my disposal and it was not even sore within minutes afterward. Things like this happen when I am trying to homeschool my daughter, write an article under a deadline, and bake at the same time. I am really not a multitasker.